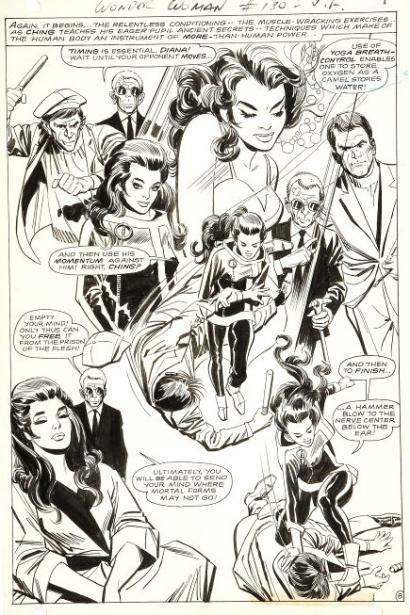 Weird Suspense was one of the better books Atlas Comics produced in their short run. 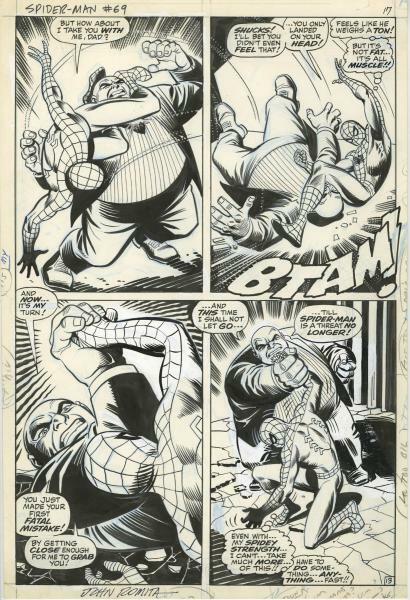 Written by Michael Fleisher and drawn perfectly by the moody work of Pat Boyette it starred a spider-man monster called the Tarantula. The story begins in Europe during the Middle Ages where hideous huge spider monsters led by their Spider-Priestess terrorize the countryside transforming the innocent villagers into these vile creatures. Count Lycosa follows the giant arachnids back to their lair to find their princess. He quickly returns to the village, rallies the townsfolk, slaughters the tarantulas and burns their beautiful leader at the stake. 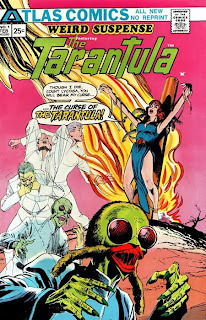 Unfortunately, before she dies she places a curse upon all the male descendants of the Lycosa family, the curse of the Tarantula! 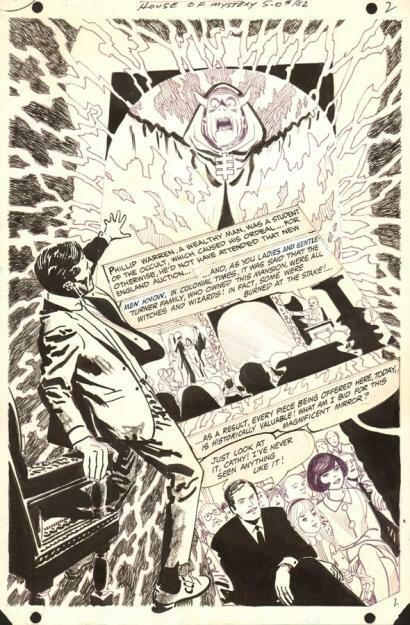 As the tale shifts to the modern day, Count Eugene Lycosa, the 11th in line to bear the heinous curse, has vowed to use his tarantula powers for good to protect the helpless and prey on evil. 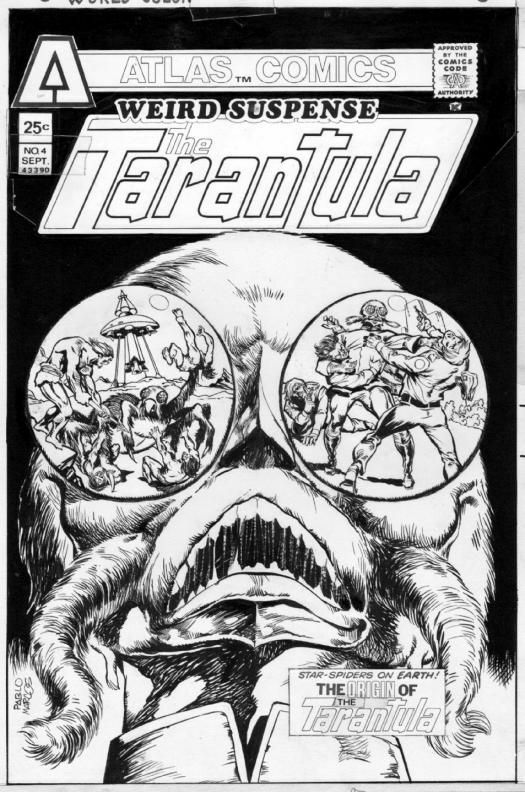 So over the next three stories, our European nobleman transforms to the humanoid-tarantula creature to confront some escaped prison killers who think they can prey on the Count and his butler in there mansion estate, a gang of city hoodlums, and even a tricky swami. 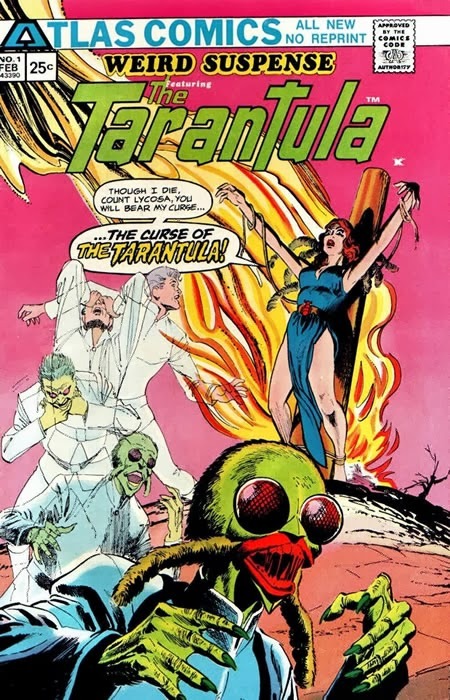 But the Tarantula's greatest foe was the Spider-Priestess being reborn from ancient rites preformed by her Spider-Cult, as she is revived by an hypnotized thug only to eat him as his grim reward. This evil woman kills the Count's manservant, luring him to her secret arachnid infested mountain cavern to trap our weird hero. But at the last moment the tables are turned by a stroke of luck as the Tarantula battles the Spider-Priestess on a cliff edge where she falls to her death below. 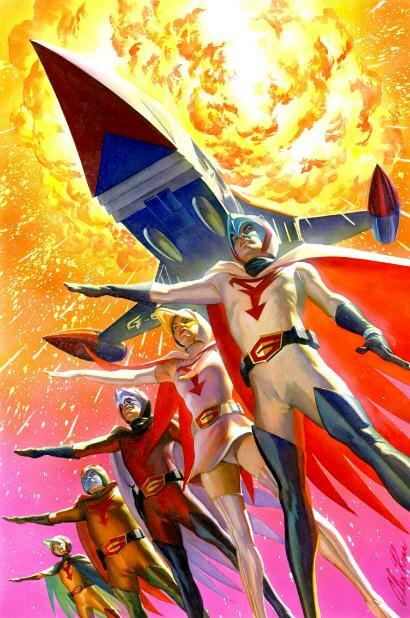 Featured here is the unpublished cover to the fourth issue that never saw the light of day by artist Pablo Marcos! 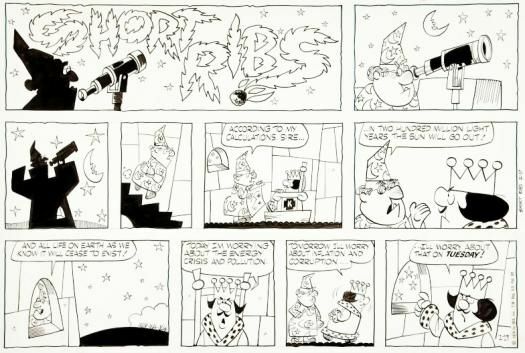 If you read Short Ribs at all, you can see that a substantial amount of evolving has gone on in regard to the design of the characters. This is, I hope, the result of a desire for constant improvement of the product. Since an individual character doesn't appear more than once or twice a week, I have a little more freedom design-wise. Otherwise, the idea behind Short Ribs hasn't changed a great deal. My purpose is just a quick little spot of entertainment...perhaps with a little thought thrown in once in a while. Also, I make an attempt to make it visually interesting. I make a point of meeting deadlines, which I'm given to understand is something unique in the cartoonist. Really, there isn't any set pattern in the production of a week's work. I do, However, complete all the daily strips before starting on the Sunday page. Everything is done on clearprint tissue, in pencil, and then pasted behind a sheet of #2 ply board, and inked with a #2 brush. Once in a while I'll use a pen for fine detail. The lettering is done with a #14 relief pen. I have a studio here in Carmel Valley Village, since I find it difficult to work at home. Too, I have an assistant who comes in three days a week. He does just about all my, filing and house cleaning. I tried to work without an assistant for quite some time...largely because of financial reasons, but I found that the assistant helped remove much pressure, and that Short Ribs was the better for his help. If I have a gag that requires a little different atmosphere, we can spend more time experimenting with backgrounds and characters. In the gag department, I usually have something ahead in order to get the week started on Monday morning. However, there have been many times when I've had the "empty page blues." So far, I've managed to come up with a gag every time I've headed for the bathroom to cut my throat. Thank goodness. Normally, I arrive at the studio between 8:00 and 8:30. I leave any time between noon and 5:00...just depends on how things are going. Mostly however, I like to be able to see the end of a week before I start goofing-off. By that I mean that I like to have a really good idea of just what I'm going to wind up with when I mail my weekly package to the office in Cleveland on Friday. I never thought about the reprint market outside the United States, but within the last few years I discovered there were a lot of Turok, Son of Stone issues published in Latin America by one main publisher. 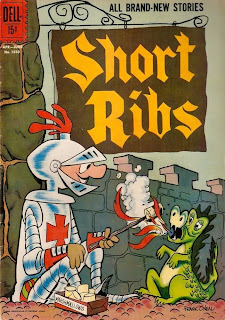 England, Italy, and Germany attempted some minor reprints in the 1970s from the original Gold Key series, but only one or two issues ever saw print, with one company publishing nineteen books in their entire run. 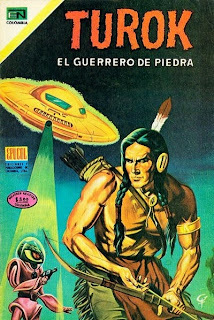 Editorial Novaro, based in Mexico City started their Turok, El Guerrero De Piedra series in 1969 and lasted a whopping 274 issues that I know of, over twice as long as the original Dell series! So what do you do when you run out of reprints? Start creating your own stories and covers adopting the customs and flavor of the publisher’s home country. 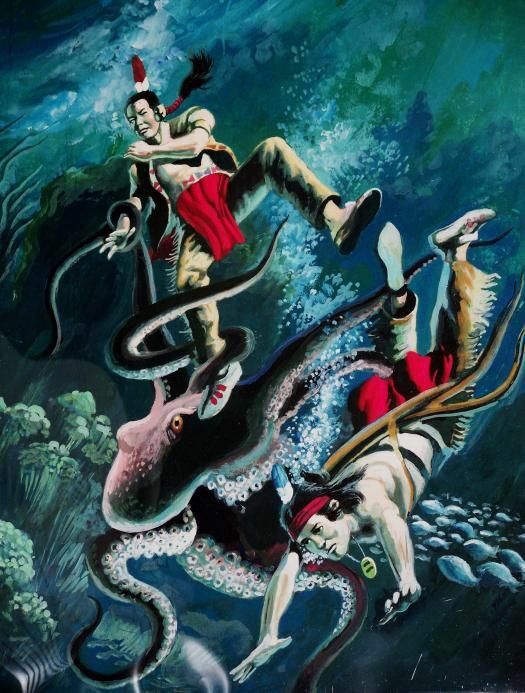 Artist Francisco Betancourt did many of the colorful painted Turok covers in his bold style, often using direct or composite swipes from the Gold Key covers, while the interiors miserably failed to live up to the standards set by Alberto Giolitti. 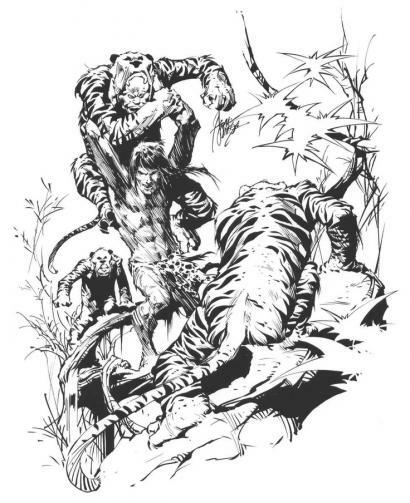 As well as the covers, art swipes from Frazetta, Boris, Kubert, Thorne, and many other American and European artists could be found inside these books. 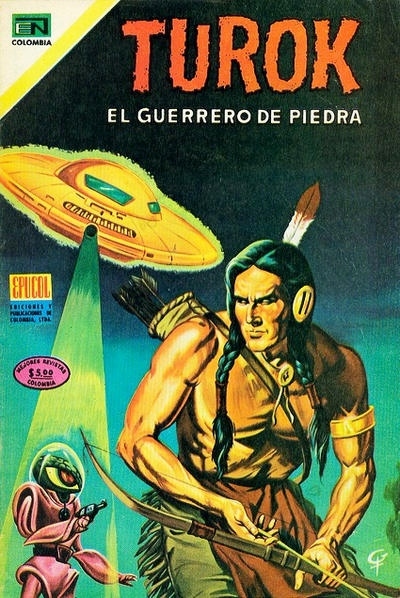 Columbia’s Epucol started their Turok series in 1976 lasting over 200+ issues, being a sister company with Novaro, they had the advantage of using many of the prior Mexican covers and stories, though they created wild new adventures too. 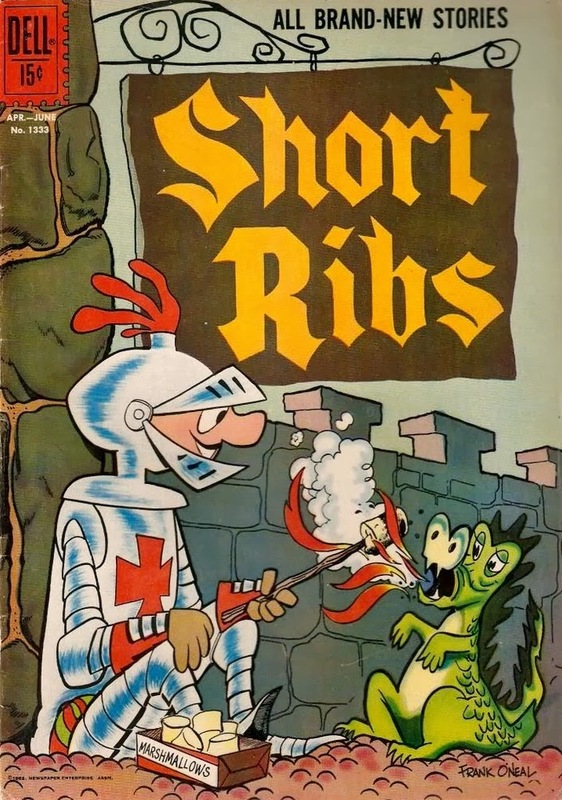 Often a little bright at times when compared to American comics, these little digest gems were extremely popular and sold a great number of copies. 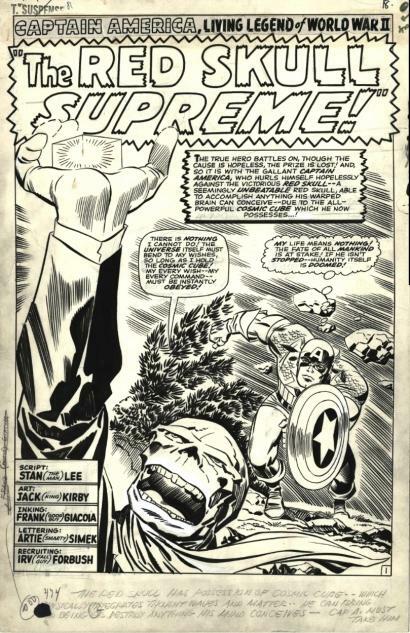 Published as two issues a month or more at the height of their popularity before their demise, Novaro’s printing presses were destroyed in the devastating Federal District earthquake of 1985 which finally closed the company and Turok’s long run south of the border. 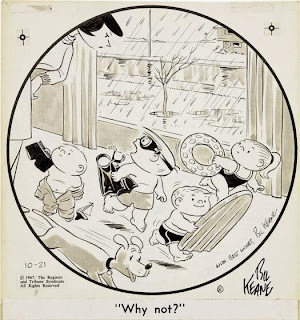 Like the portrait of Dorian Gray my photo keeps aging in each National Cartoonist Society album (but so does the real-life Bil Keane!) I'm making a living doing what others are jailed for: exploiting my family and peeping in windows. I was born at a very early age. The Stone Age (1922) in Philadelphia and grew up there physically if not mentally. Best idea I ever had: marrying Thel in Australia (1948). I penciled in five children, Thel did the reproductions. 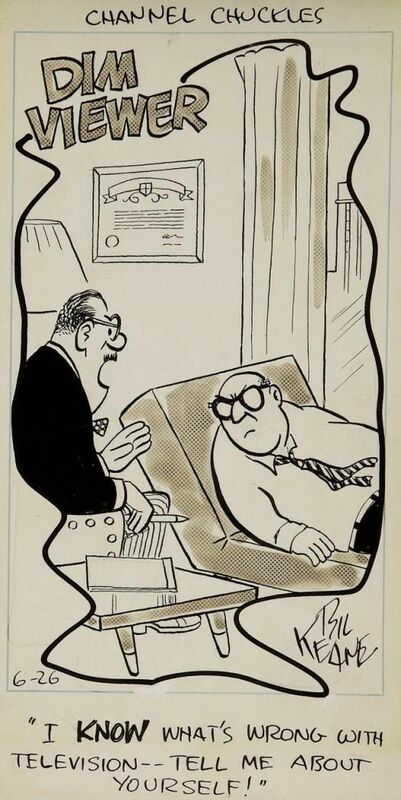 Sold gag cartoons to all the magazines that folded. 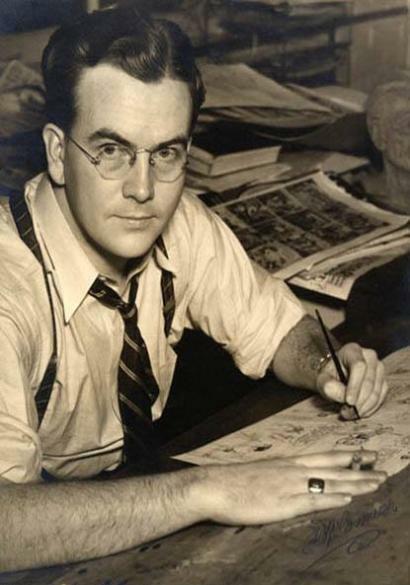 I was a staff artist on Philadelphia Bulletin from 1946 to 1959. When I tired of drawing staffs and moved to Arizona where I'm still studying to become a saguaro cactus. Did "Channel Chuckles" from 54 to 77. 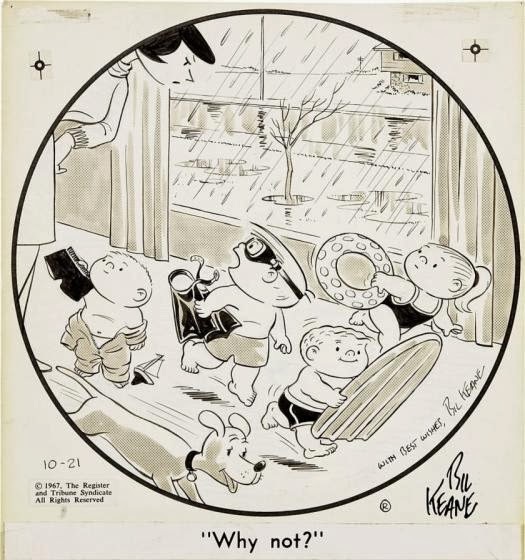 Created "Family Circus" in 1960 and I've been going around in circles ever since. Little Jeffy is now my assistant. He's no longer two feet tall and a pest in the studio. He's six feet tall and a pest in the studio. Thel and I spend a lot of time these days counting our many blessings. Born in New Holland, Pennsylvania, in 1902, Dorothy Hood early interest in art encouraged her to attend the New York School of Applied Design. 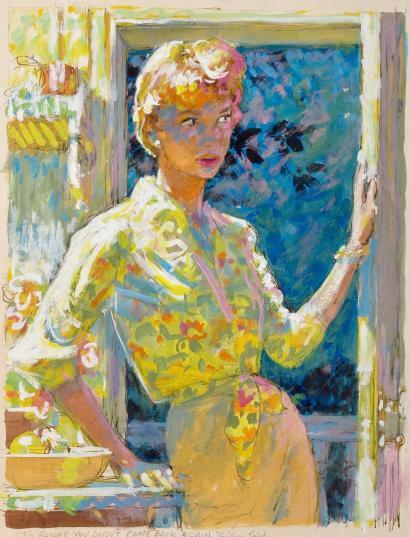 Later while working for Macy's department store, she met art director Harry Rodman who took the artist with him when he landed a position with Lord & Taylor. 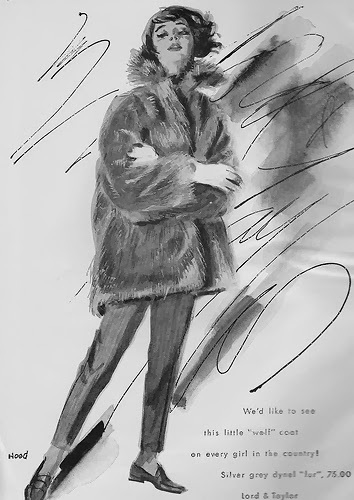 Rodman capitalized on his new advertising "Lord & Taylor Look" in the 1930s using the talented illustrations of Hood which had there own unique style. 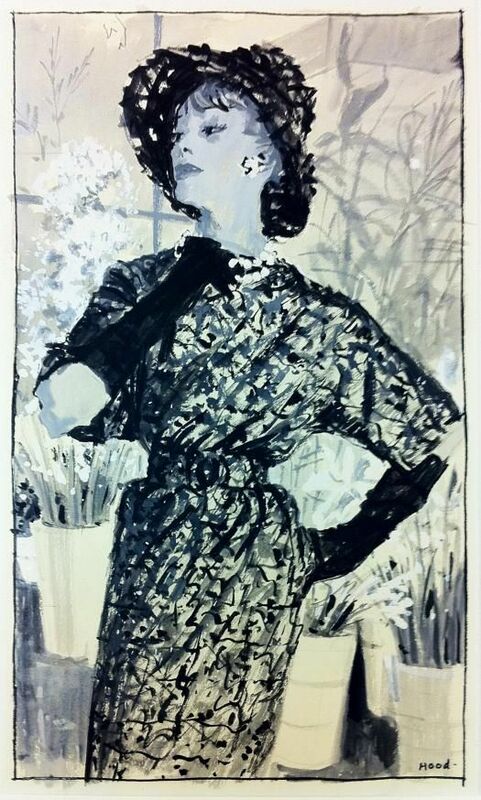 Her black-and-white wash drawing technique done to size was ideal for newspaper reproduction and instantly recognizable as one of Lord & Taylor's. Working directly from life, Hood posed her models depecting real life activities women could identify with. Her extra additions of a slight background of a spray of flowers here or a chandelier there added more dimension to her scenes. Helping establish the "look" of the high-quality department store, her successful illustrations would appear in newspapers and magazines for decades providing the public with a sense of what the well-dressed American woman should be wearing. Short deadlines faced by fashion illustrators poised no threat for Hood, since her studio was located close to the store as models, merchandise, and her artwork could easily travel back and forth. While on vacation in the 1950s in Bermuda, a motor bike accident seriously injured her right arm, but taking it in stride, the artist taught herself to draw with her left hand. 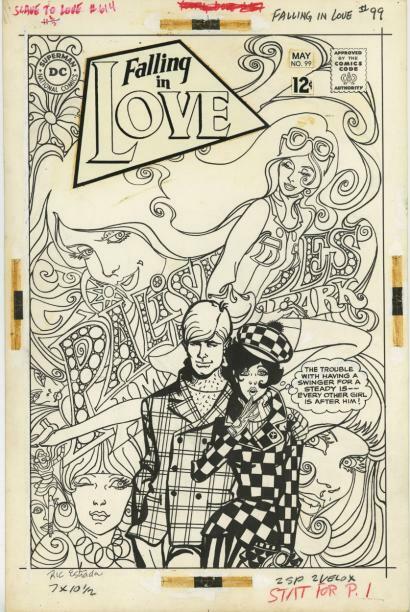 Only her most close friends were aware of the very difficult transition the artist overcame as she continued to illustrated for Lord & Taylor until her death in 1970.